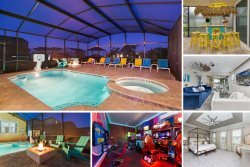 This brand new vacation property will have 5 luxurious bedrooms, "Drive In" themed movie room with theater seating for 8, "The Loft" bar upstairs featuring pool table, bar, and arcade driving games. There are 2 elegantly appointed master suites with king size beds upstairs and one queen en-suite room downstairs. All have their own bathroom each with dual sinks. There are two themed children's rooms: One is an interactive Star Wars room, where your kids will feel like they are in a ship blasting away at asteroids and planets. This space-tastic room features 4 full size beds to sleep up to 8 and a ceiling galactic shoot out game controlled by iPads. The girls room features Moana with full height murals and also has beach house bunk bed. Hang out in your very own bar! The "The Loft Bar" upstairs features a full size bar with an industrial appeal. You and your guests can enjoy playing pool, listening to music and there's even room for dancing. Get ready for some real fun - racing style! Your family will have a blast racing against each other on 4 arcade style driving games. Not in the mood for games? Relax and recline in the "Drive in" themed movie room with it's twinkling ceiling and Hollywood backdrop. The main living area is open plan and has plenty of comfortable seating and a wall mounted flatscreen TV. Sliding doors to the patio can also be accessed via the living area where you can relax under the covered lanai or cool off in the pool. Enjoy your meals in the dining room if you find that you need a break from the Florida sun or dine al fresco at the patio table during the cooler mornings and evenings. For those that enjoy laying out in the sun, there are 4 sun loungers, perfect for topping up that tan, reading a book or enjoying a cocktail poolside. There's a fully equipped kitchen for all your cooking needs with breakfast bar seating, perfect for children.